Is M. Night Shamalayn back on track? After so many years of mediocre to crappy movies being pumped out, he's finally taken it a step back and went to the genre most people go to, to get noticed: horror. While I really enjoyed The Visit, Split absolutely blew my mind to pieces. I've been obsessed with Anya Taylor Joy since The Witch so am elated that she appears to be on the fast track to Hollywood's A-List. What is with that new Gorillaz album? I've been waiting for a new Gorillaz CD for years and this is what we finally get? An odd mish-mash of dance music and soul? 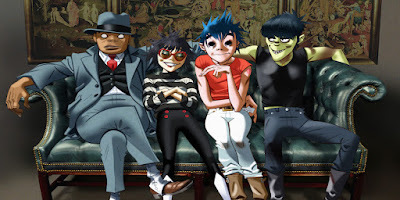 There are a couple songs on the CD that are tolerable but that's pretty inexcusable when it comes to a Gorillaz CD. There's always the off chance that this ends up aging well and growing on me but I'm decidedly pessimistic with the offerings. If you have Netflix check out Campus. It's fantastic and I can't believe I'd never heard of it before. It's about a University in England and the misadventures of the staff/faculty. The unfortunate news is that there are unfortunately only 6 episodes and, with it being made in 2011, the likelihood of any more isn't good. I think Steven Weber may have ruined other audiobooks for me. After listening to him read Stephen King's It to absolute perfection, my expectations have been officially set too high. Anything else I listen to just doesn't have the same dramatic flair. Weber made everything seem important and, listening to a book like The Stand now, I'm having a lot of difficulty getting through it with the vanilla narrator. I refuse to see Alien: Covenant. I am a huge fan of the Alien series (last night I fell asleep to the 12 hour "Making Of" in the Anthology Bluray) but I just can't do it. It looks stupid and I decided long ago that I wouldn't support any movie I didn't think look good, just based on name alone. I'm not sure if I'll ever pay for another Ridley Scott film again. Outside of the obvious (Michael Bay), I view Scott as one of the worst working directors today. Sure, his films look pretty but that's where it ends. I listened to a Harry Styles song...and loved it. I recently re-upped my Apple Music subscription because I felt the need to expand my music choices again and I'm glad I did because "Sign of the Times" is one of the better pop songs I've ever heard. I liked it so much that I actually listened to the entirety of Styles solo album and get this... I dug it. Crazy right? If you haven't heard the song, I highly recommend you check it out.